This Celtic stained glass suncatcher depicts a favorite Irish blessing, sláinte, meaning cheers or good health in the Gaelic language. It is the common Irish toast and can often be heard in pubs, when glasses are clinked together in friendship. 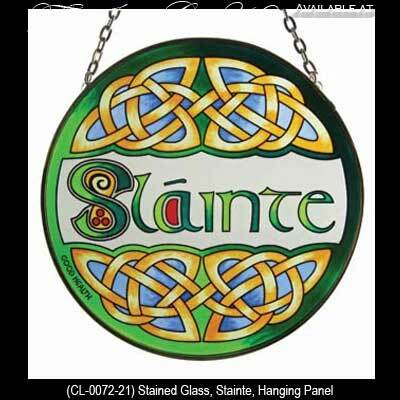 This Celtic stained glass suncatcher features an Irish blessing, sláinte, and is enhanced with knot-work. The Irish suncatcher measures 6 1/2” round and is constructed of glass with a metal rim along with a metal chain for hanging. The Irish suncatcher is ready to hang in your window and it is gift boxed with a Celtic knot history card that is complements of The Irish Gift House. This stained glass Irish blessing is made in Ireland by Clara.